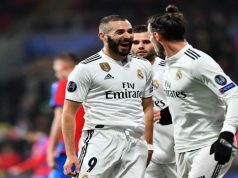 Real Madrid trashed Rayo Vallecano at the Santiago Bernabeu as the visitors were down to nine men since the 29th minute. Rayo played better than Los Blancos during the first 15 minutes and took a 1-2 lead, but Tito’s red card completely changed the game. Real levelled and ended up humiliating Rayo when the referee conceded a controversial penalty and showed Raul Baena a second yellow card. Rafa Benitez men opened the scored after just four minutes, as Bale assisted Danilo and the Brazilian found a route under Yoel from inside the box. Rayo came back with two goals in two minutes. Amaya rose to meet a corner and angled a perfect header past Navas, and Jozabed also brilliantly headed home after meeting a cross from Pablo Hernandez. 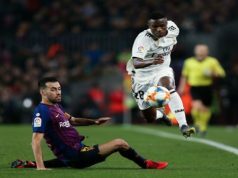 The Santiago Bernabeu fans had started booing when things got better for Los Merengues, as an awful Tito’s tackle on Kroos saw the defender sent off. Los Blancos levelled as Danilo raced down the right and delivered a super cross onto the head of Bale, who tucked it home from close range. 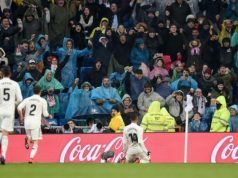 Five minutes later, Baena brought Ramos down inside the box and the referee conceded the penalty shot, showing the Rayo man a second yellow card. Ronaldo converted to make it 3-2. Things were pretty easy for the hosts from that moment on. Bale scored the fourth before the break after collecting a pass from James and firing an effort into the bottom. James also assisted Benzema and Ronaldo. The Frenchman took a touch before finding the bottom corner and scored the fifth goal. Ronaldo netted his second after heading a simple James cross into the back of the net. Bale scored completed a four-goal haul scoring two more. First he turned a low cross from Ronaldo into the back of the net. Seven minutes later he played a one-two with Rayo defender Quini and finished into the bottom corner. Benzema closed the score with two more goals. First he settled inside the box before finding the bottom corner. In the last minute, he earned a hat-trick as he fired one into the bottom corner from inside the box.